March 12th is the Primary for the Special Election to fill Michigan’s 27th District State Senate seat. Jim Ananich, Robert J. Daunt, Chris Del Morone, Adam Ford, Ted Henry, Woodrow Stanley, Lawrence Woods. All Candidates have been invited to speak on Tuesday, February 26th, 5:30-8pm, and will respond to questions posed by the sponsors, as well as by the audience. The Forum will be held in the Reading Room of the Flint Public Library. Event Co-Sponsors: NAACP-Flint, League of Women Voters-Flint Area, Concerned Pastors for Social Action, Delta Sigma Theta, Inc.-Flint, Flint Area Public Affairs Forum, and the Flint Public Library. This Friday our theme is “The Master Plan’s Influence on Economic Development.” Bob Wesley will be speaking to the group; he sits on the Flint Planning Commission and Co-Chair’s the City of Flint’s Master Plan Steering Committee. Join us as we discuss Flint’s economy and how the Master Plan will influence and shape our future economy. As usual, we meet at Hoffman’s Deco Deli & Cafe, 503 Garland Street, Flint, MI 48503. Networking starts at 7:30am with the speaker at 8am. We at Flint Club like to promote the positive that is happening right here in Flint. Today we’re promoting a fundraiser that is not ours, nor is it in Flint – this is a fundraiser for a neat organization that is working right here in Flint called the Flint Public Art Project (in fact, they’re our office neighbors at the Flint Local 432). This Spring Flint’s “Chevy in the Hole” site will be taken over with a 3 day “Free City” festival! 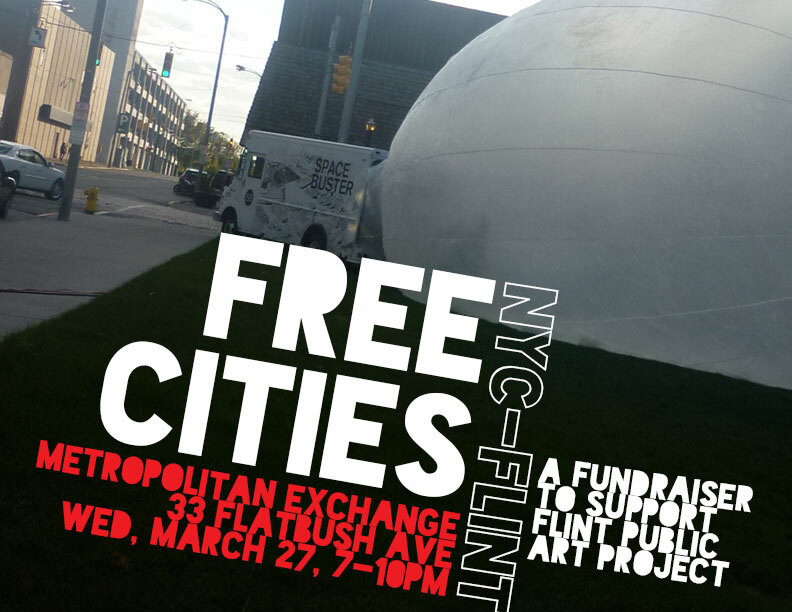 In order to support this event, Flint Public Art Project is hosting a fundraiser in Brooklyn on March 27th. Please see below for all the details. For those in the NYC area, please check out the fundraiser! For those here in Flint or elsewhere in the world, please share the Free Cities fundraiser with your NYC friends & family. And don’t forget to mark your calendars for the festival, May 3-5, 2013. Flint Public Art Project partners artists and designers throughout the country with community groups in Flint to produce projects that re-imagine and revitalize the city. Our work relies on partnerships and creative exchanges that connect Flint to cities around the world, particularly with our friends and colleagues in New York City. Please hold Wednesday, March 27 from 7-10pm on your calendars at the Metropolitan Exchange building in downtown Brooklyn for our first NYC-Flint fundraiser. We’ll look back at our accomplishments in 2012 and raise money to support new programs in 2013-2014. A team of Flint artists will design the space in Brooklyn, New York DJs will spin Michigan-themed tracks, and a Brooklyn caterer will offer three takes on the Flint Coney. Tickets will be available at the end of February. Please see the short summary below for more information about Flint Public Art Project, and email info@flintpublicartproject.com with any questions. Flint Public Art Project organizes public events, workshops, and temporary installations to inspire residents to re-imagine the city, reclaim vacant and underutilized buildings and lots, and use innovative tools to steer the city’s long-term planning. We support collaborations among local residents and organizations with leading artists, architects, planners, and community organizers from around the world, connecting the city to regional, national, and global movements to revitalize places through art and design. – deployed a 50′-long inflatable plastic dome in underused sites, hosting potluck dinners and film screenings, dance parties and panel discussions. – offered community-design workshops to a dozen organizations, including a three-day project with carpentry students at a federal job training center to install seating at bus stops. – convened a three-day urban revitalization conference, culminating in the first-ever public tour of an abandoned, former Chevrolet manufacturing site, where we will host an international public art festival in May. – launched an international design competition to build temporary structures to support public programs in the central parking lot downtown; to date more than 300 participants from 30 countries worldwide have entered. How can you help Flint Club? In 2012, Flint Club gained three new members to our Board of Directors, revised our mission and vision statements, and delved into strategic planning with the BEST Project. 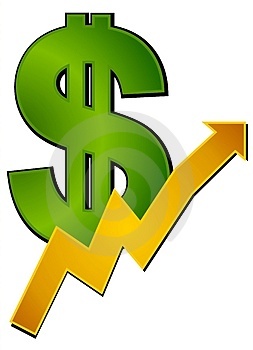 Already in 2013, we have added a new Treasurer & Finance Chair to the Board and have begun to implement our strategic plans. It is our mission to focus on promoting Flint through positive stories, community programs and new opportunities to attract and retain committed, talented people who make Flint a flourishing place to live, work and play. Our efforts nurture community pride through an emphasis on Flint’s rich history, the importance of active citizens and sharing positive developments across the city. We, at Flint Club, believe Flint is a unique, diverse and versatile city with a rich history of reinvention and perseverance. Flint Club aims to ensure talented individuals continue to participate in the city and actively contribute to the transformation of Flint. Flint Club highlights the positive and uplifting events in our community and presents programming that enhances the progress of the city toward becoming great once again. To this end, we collaborate with those who envision Flint as a flourishing city; friendly to business, safe for all citizens and exciting in which to live, work and play. Pride in the past, present and future of our community, begins with you. The people of Flint, our expatriates and friends in the surrounding community, are what make this city great and the ones who ultimately project our city’s image. By being a member of Flint Club you will be invited to positive programming such as our 4th Friday Series, have the opportunity to support the Flint Club Youth Forum, and engaged with the stories and true faces of the people that make up Flint’s diverse community through the I Am Flint project. The Board of Directors strongly encourages you to engage in Flint’s future through Flint Club, and to do so we need your updated contact information! Please fill out the donation information at this link. To continue supporting our programs, a membership donation would be appreciated. 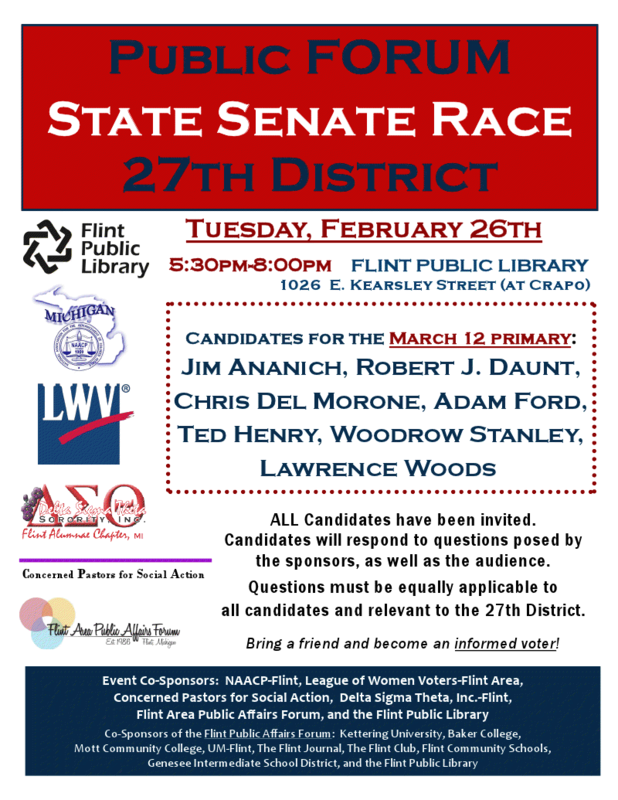 Join the Flint Area Public Affairs Forum on Tuesday, February 12th, at the Flint Public Library starting at 5:30pm. Refreshments will be provided. Sponsored by: Kettering University, Baker College, UM-Flint, Mott Community College, The Flint Journal, Flint Club, Flint Community Schools, Genesee Intermediate School District and the Flint Public Library.